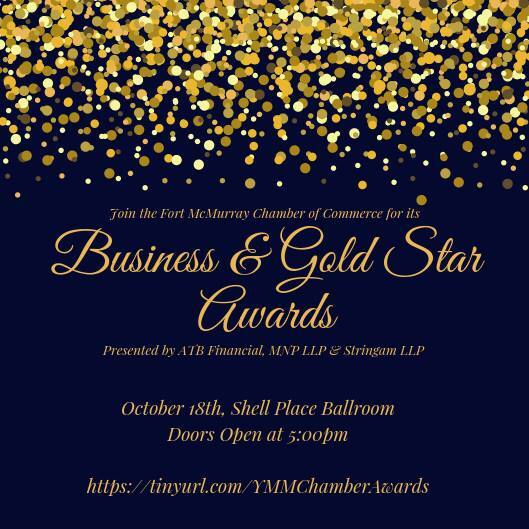 When I found out we were nominated for the 2018 Fort McMurray Chamber Business and Gold Star Awards, my first reaction was “WOW!”. There is no doubt in my mind, that every day my teammates and I wake up and do the absolute best job, but to be acknowledged and recognized for our efforts is beyond a HUGE compliment. Fort McMurray is an extremely important community for us. Many of us came from smaller towns and moved to Fort McMurray for the opportunities it provided. Fort McMurray has become more than an opportunity to us now, it is HOME. We all are raising families here, have dear friends here, and contribute to this community in any way we can. As I scroll down the voting ballot and see the caliber and quality of the other businesses being acknowledged, it is amazing. Whether it is somewhere I eat on a regular basis, take my daughter to dance at, do family activities at, shop at, leave my fur babies with, or refer clients to – they are all amazing companies! Many of these individuals and businesses I admire, am inspired from, or grateful for the connections they have brought me within the community. Although many of the businesses and individuals nominated this year are different in many ways, I do see one very evident, common thread amongst us all. We are all passionate and love what we do, and more importantly, who we do it for; we are all passionate about our community and making it stronger and better. Win or lose, I just want to say ‘THANK YOU’! THANK YOU to whoever nominated us, for including us in this group of outstanding individuals and businesses and THANK YOU for supporting our business every day, whether it be voting or spreading the word to those you love about what The A-Team is all about! I assure you that each and every member on this team will continue to help people buy and sell homes with amazing results, achieve goals, create memories, be apart of milestones, and form lifelong relationships. I want to say THANK YOU to RE/MAX Fort McMurray for embracing and supporting our team, I am so grateful to be apart of a brokerage that gives back so much to our community. THANK YOU to Tom & Breanna Albrecht for having the vision of creating such an outstanding team and inviting me (Erin Ogren) to be apart of it; the hours you dedicate to improving our business and overall success do not go unnoticed. Thank you to the rest of my teammates, Aaron Chalmers, Denise Hildebrandt and Heather McCandless for being such amazing individuals to work with, rely on, and be a part of this journey with. The learnings, innovation, and dedication on this team are priceless and I am so proud to be a part of it. Thank you to our ‘behind the scenes’ staff of admins, assistants, photographers for removing stress so we can focus on what’s most important – our clients! Lastly, thank you to each of our loving families who support the crazy hours, schedules, and lifestyle so we can all excel at the careers we adore! We LOVE you Fort McMurray and look forward to many successful years ahead of serving you because, without you, we wouldn’t be here today!! We’d love your support as well! To vote for the A-Team, visit the polling form here. Erin is a specialist buyer’s agent. Separately, she is a Candidate Appraiser, which gives her advanced skills in pricing homes for her clients: She is The A-Team’s valuation expert.